Budget Book 101 to Make You a Finance Ninja. Read this complete guide! You are here: Home / Manage Finances / How to create a Budget Book that Makes You a Finance Ninja. Full Guide! Learn in this easy to follow, complete guide how to create a killer budget book for tracking household expenses. Track expenses like a boss and find saving margins. Learn exactly where your precious money has gone! 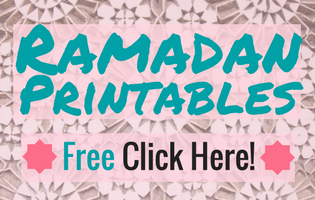 Free Printables and editable Templates included. You created a basic budget in three simple steps and a cash flow sheet to monitor and foresee financial movements. But now what?? Find out where exactly your plus is going with a personal budget book. Find margins and saving potential. Learn how to create an expanse-tracking monthly budget book in this full guide for beginners. Start now using the free editable expense tracker spreadsheets and printables. Track your spending and find out if you spend more than you should. A budget book is your personal expense tracker for all the expenses that are not covered by the fixed expenses of your monthly budget. You already know your fixed expenses if you created your super simple monthly budget. You know how to monitor movements on your bank accounts with the personal cash flow sheet. What remains to be examined is where your cash goes and how much you spend on what exactly. you could compare your expenses for groceries with the average and find that you spend a lot more. So from now on, you learn about saving on groceries and feeding your family for less! Or you realize that you spend way more on coffee-to-go and glossy magazines than you thought. So you make your Frappuccino at home and read more awesome blogs like this one! Did you ask for more awesome mom blogs with fres financial advice? Here you go: 13 Must-Follow Personal Finance blogs for moms – written by moms who have been there! Don’t panic. You can do this! 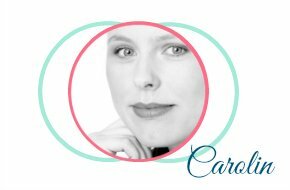 I will break this down and provide done-for-you budget book templates. Go with the fully editable and automated digital file or print out the budget book spreadsheet each month. Include all expenses that are not already in your simple monthly budget.. Decide if you want to track incoming money, too. I don’t and just include all my expenses of day-to-day life. It can be handy to have an extra tracker of tax-deductible expenses, too. When I started to keep a household budget book I just used plain paper and write down the expenses of the day, one after the other. It was cumbersome to go through this list at the end of the week or month to add things up and I sometimes got totally lost. 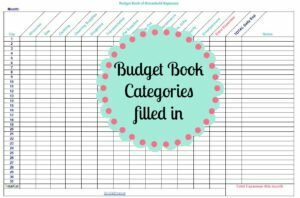 Learn how to make your personal budget book better by using categories and a table format to organize your expanse tracker. 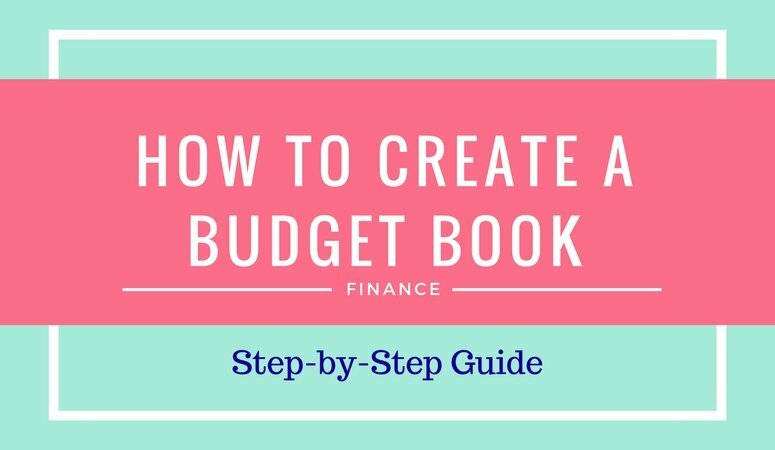 First, decide what categories to include in your budget book. Categories group together all the things you spend your money on. You will write down each expense in one category only. That way you can easily add them up at the end of a month. Some categories are mandatory, others depend on your situation. You need to find out which categories make sense for your family. 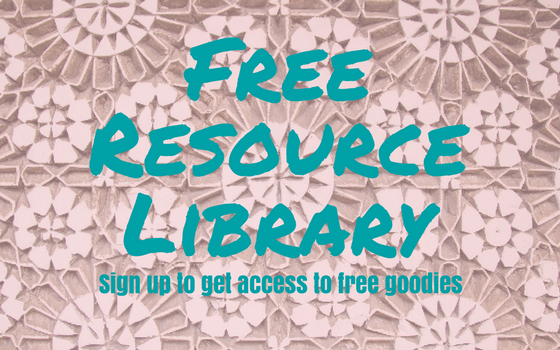 -> If you are a subscriber to my newsletter you will find a budget book categories worksheet in the free resource library. This will make it easier to decide on the right categories. If you are new here you can subscribe at the bottom of this post. Here are some budget book categories to give you some idea. You can further divide categories. For example, in addition to just “groceries”, you could have separate categories for beverages, sweets or meat. These have some saving potential to check out! If you want a jumpstart then use the printable shared in the subscriber library that has categories already filled in. You could work on your budget book daily or weekly. You could even do it on a monthly basis but this is a lot of work and you might forget things. If you tend to forget what you spent then a daily budget book session is best. Track all your expenses the very same day. This only takes 2 minutes of your time. If you prefer a weekly finance recap make sure to collect all receipts in one place. Maybe make a cute receipts jar. Remember that you need to keep some receipts for tax time once you have used them for your budget book. Unfortunately, it takes a little bit of discipline to make your personal budget book work. Yes, sometimes you just want to skipe these budget book tasks. I feel you! Keep in mind how much value a budget book offers. These 6 tipps of the Busy Budgeter to hold onto budgeting if motivation drops to zero may help you! The advantages of a digital budget book are clear: You can have expenses automatically added up for a monthly and daily total sum. You can even add a yearly spreadsheet to monitor your spending habits long-term. 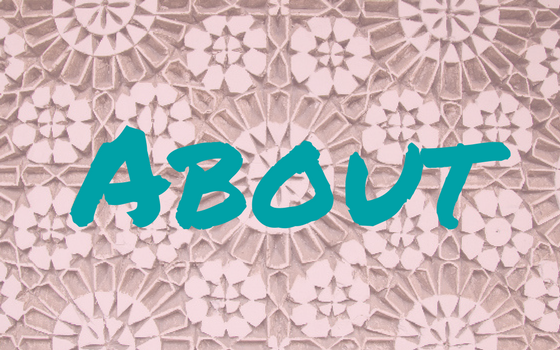 I’m more of a pen and paper person and I love cute printables. As a budget book, I use an actual budget book I got for one Euro. And I like to just jot down things without getting to the computer or phone. At the end of a month, I have to sit down and punch a lot of numbers into my calculator. To get you started I created a digital budget book spreadsheet you can edit and make fit your needs. 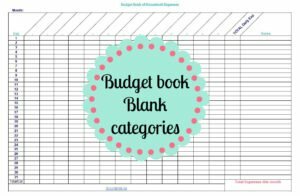 If you are anything like me and you prefer to use pen and paper go with the printable budget book spreadsheet. Start tracking your expenses and learn where exactly your money is going and where you can save some cash. 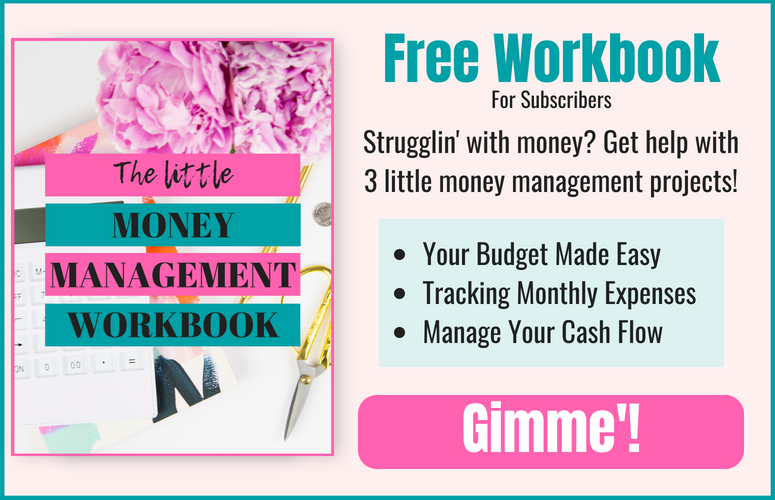 Get yourself a ready-to-use budget book from the store, use a simple sheet of paper or the free printables I share with subscribers. There are two versions of a monthly budget book. One has categories already filled in with an extra category for expenses that do not fit in elsewhere. The other version has blank fields so that you can fill in the categories you want to use. Instantly get access to the free budget book printable, exclusively for subscribers. The budget book printable covers one month. Print one for each month so you can later review them and estimate your average spending and learn about your spending habits. Each day or week fill in every single expense wether it was cash, per debit card or credit card. Leave out only fixed expenses you have tracked in your basic budget. Sum up all expenses of one day and fill in the column on the right for daily expenses. Sum up the expenses of one spending category at the end of the month and fill this number in the cell at the bottom (total/cat). Then add all categories total expenses to estimate the total expenses of one month. You don’t need to calculate both, the daily total expenses AND the total expenses per category. You can choose one and use this one to calculate the monthly total. You can buy electronic budget books, find an app or use my free budget book spreadsheet that I provide in the free resource library for subscribers. The digital budget book template I share comes with automated equations. Another Plus: It covers six months of expenses and automatically calculates your average spending per month. With an average using six months of data you will get a good understanding about your spending habits and can compare your expenses with the average American’s spending. Access the free budget book template in the free library for subscribers. Then make a copy for yourself. (File – Make copy – Enter a name – press ok). Total expenses of each day and each category, as well as each month, will be calculated automatically. Also, your monthly values will automatically be filled in the six-month-average sheet and then calculated. You need to fill in six months to see the exact average. Time to create your personal budget book and track your spending. Start today! Half a year from now, you will have a wealth of data and a perfect asset to transform your personal finances and find any saving potential. Subscribe now to the newsletter and download the free worksheets, printable PDF or digital and editable. If you already have a personal budget book read about the biggest mistakes people make with their budget books and how you can fix them. Awesome post with proof of income! This post is like a treasure for me. keep it up. I hope you will post such informative articles in future also.